All of our online products are digital downloads. If you want a manual and diskette mailed to you, add this item to your cart. Only add one item per order. 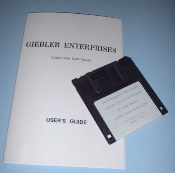 This is a manual about our software and a diskette containing the software packages you include with this order. Please note that if you order this item without a software package, you will only receive a manual - be sure to specify which of our software manuals you wish to purchase under special instructions.